Pretty pink earrings by Margherita Burgener. Today, I have two extraordinarily pairs of pink earrings to share with you. Diamonds, gemstones, loveliness. These Margherita Burgener beauties feel retro inspired to me: the almost wing-like shape of the surmounts, but in a more delicate, sharper modern incarnation. They’re fairly large; two whole inches in length. This second pair of Margherita Burgener earrings are even bolder (and I actually love them EVEN more). First of all: the luscious pink kunzites. They’re glorious: they total just over 40 carats. But that’s not all that makes them amazing: look at the pavé-set diamonds surrounds, the larger step-cut rectangular diamond links, and the texture leading up to the top of the earrings. Just magnificent. Which pair of these pink earrings is your favorite? I love them both…but #2 is the clear winner for me. 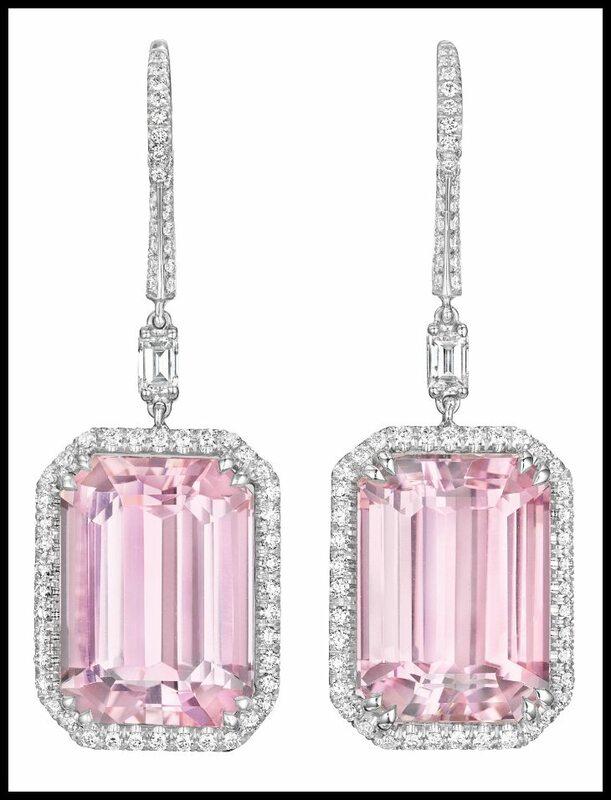 These beautiful pink earrings were all listed in a recent Phillips auction. All images and info are thanks to Phillips. Please see individual descriptions for source links. Yay or nay: pastel gemstone earrings. You’re going to love or hate these pastel gemstone earrings. You see what I mean? They’re not your average ear wear. These earrings are each anchored by a larger oval-cut gemstone within a matching surround: kunzite on some side and lemon quartz on the other. Beneath each gemstone surmount is a circular-cut diamond spacer and a pavé-set diamond cap, from which dangles a magnificent mobile of gemstones. The bunches of stones (they don’t seem streamlined enough to be “tassels.” “Pom-poms,” perhaps?) are made up of a boquet of faceted kunzite, lemon quartz and varicolored sapphire stones. Moment of truth: what do you think of these? I love unusual jewelry and I think the shape of these is interesting, but I can’t decide if I find the colors to be pretty or slightly insipid. I know I’d like these in richer jewel tones. I might like them as they are. What do you think? Yay or nay? 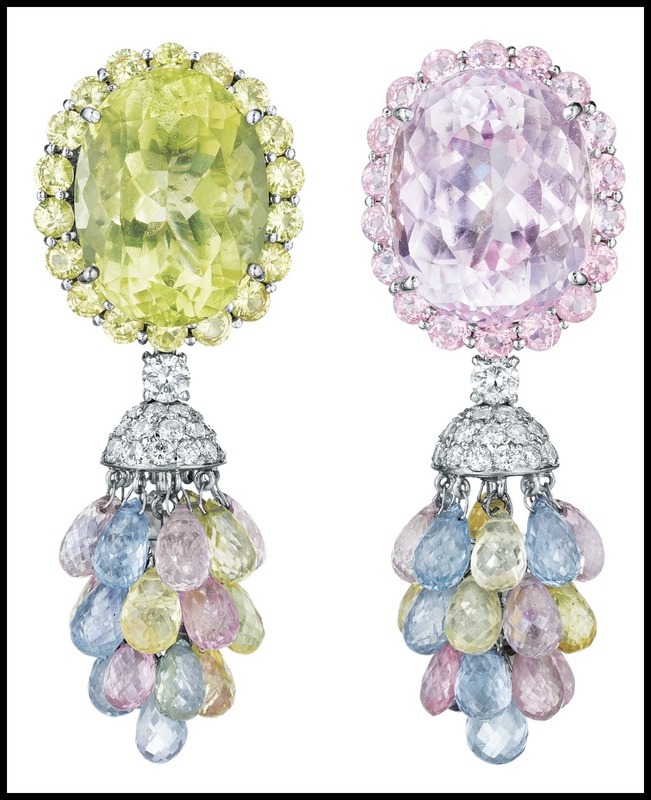 These unusual pastel gemstone earrings were listed in a December 2013 auction at Philips. All images and info are thanks to Phillips. Excellent earrings by Margherita Burgener. You’ve seen what Margherita Burgener can do with a brooch. Now it’s time to see what she can do with earrings. These earrings could have been cartoonish, but they’re so elegantly made that they retain their dignity, which is no small accomplishment for a piece with this many stars. Each earring is boasts a surmount composed of a series of star motifs of various sizes, pavé-set with brilliant-cut diamonds. 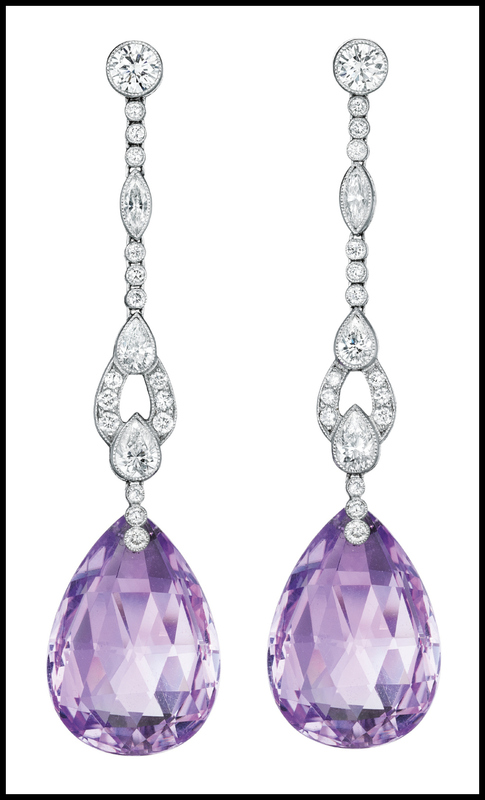 Each surmount suspends a faceted amethyst drop with a brilliant-cut diamond set cap. They’re whimsical but still beautiful. This pair of earrings is so glamorous. Both of these beauties begins with a pavé-set foliate surmount. 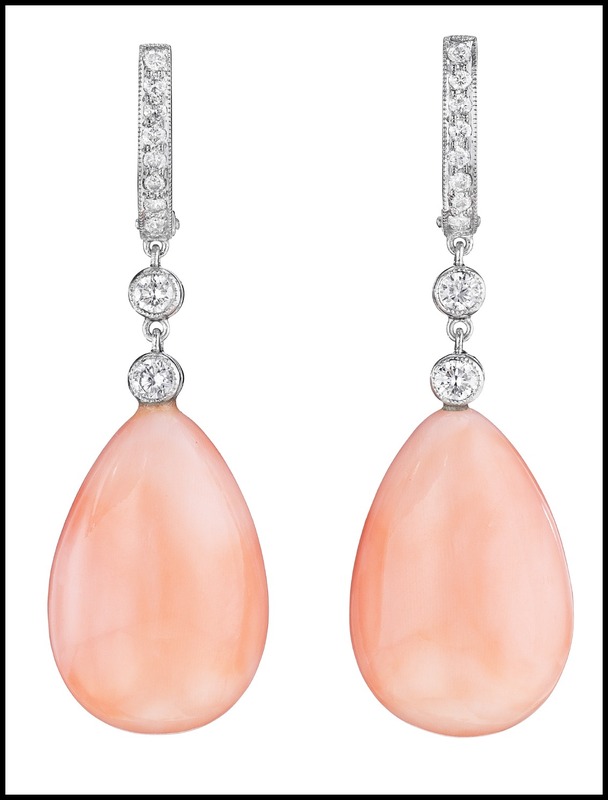 Each surmount suspends a detachable pendant of pear-shaped morganite in a border of brilliant-cut diamonds. These beg to be worn with something really spectacular. These beauties are very different in color scheme, but they’re similarly bold and glorious. Each earring suspends three graduated black onyx circular plaques spaced by pavé-set diamond bar links. These are suspended from a two-tier circular pavé-set diamond surmount, mounted in 18K white gold. At 4 1/2 inches long, these are a pretty serious statement piece. These earrings also have foliate-inspired surmounts, although they’re chunkier and less literal than the surmounts on the first pair. Each surmount on these suspends a pear-shaped aquamarine within a border of brilliant-cut diamonds. And, because it’s fun, some dresses to go with these. These pairs of earrings were all listed in various auctions. All images and info are thanks to the source of each item. Please see individual descriptions for source links. Two fantastic floral brooches by Margherita Burgener. I’ve shown you Margherita Burgener’s fantastic brooches before (one of them, anyway). Today you get two! I adore the lavish, sprawling expansiveness of this brooch. It’s like a floral explosion. It’s designed as the head of a flower, made of titanium and centered by a 22.32 carat kunzite. The petals of the flower are lined with brilliant-cut diamonds and – my favorite part – where the backs of the petals are showing, the titanium is completely encrusted with diamonds. This brooch is also titanium, but of a more colorful sort. This more stylized flower is set in the center with a cascade of rose-cut pear-shaped pink sapphires weighing 16.16 carats. The sapphire cascade is accented by round diamonds. The titanium petals of this brooch are also outlined in diamonds, bringing the total diamond weight to approximately 4.70 carats. Both of these brooches were listed in Sotheby’s auctions. All images and info are thanks to Sotheby’s. Boucheron diamond and kunzite flower brooch. This contemporary kunzite flower brooch by Boucheron is designed as a circular-cut diamond sculpted flower, centering upon a cushion-cut kunzite. The kunzite is within a marquise-cut diamond surround, the pistil and circular-cut diamond stamen mounted en tremblant. The flower is supported by the baguette-cut diamond undulating stem, decorated with two marquise-cut diamond buds and mounted in platinum. I just think it’s lovely. I love the little diamond leaves, the angle of the stem, and the delicate points of the petals. I don’t really wear brooches, but if I did, I would want one of them to look like this kunzite flower. Maybe pinned on a scarf, or on the shoulder of a dress? What would you do with it? This kunzite flower brooch was sold as part of Christie’s October 21, 2009 Rare Jewels sale. All images and info are thanks to Christie’s.